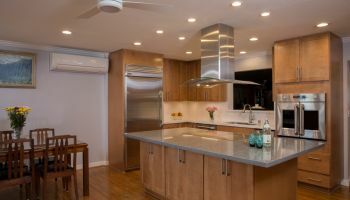 In part two of the video series "Kitchen Remodeling Advice for Family & Friends," Randall Omoto, Sales Manager at Homeowners Design Center, talks about what to look for in an expert advisor and how they help with the kitchen remodeling process. In the video "Selecting the Expert Adviser," Omoto says to, "...look for (a designer) who has your best interest at heart... somebody that is helping you design exactly the space that you want... (and can) generate a lot of ideas..." Omoto also emphasizes that you'll want to find someone with experience and has designed kitchens similar to yours in the past. Randall Omoto, Sales Manager at Homeowners Design Center, consults with a couple about their kitchen remodel. One of the most common questions among homeowners planning a kitchen remodel is which expert does what, and who do you hire for what? There are several experts a homeowner will most likely turn to during the process, with most of them getting involved at some point. The one expert that many homeowners have turned to that is probably not always the best choice is the "handyman", mainly because they aren't qualified to deal with the numerous situations a homeowner can encounter with remodeling a kitchen. In the video, Omoto warns about the work a handyman does that becomes a problem, or encounters a problem during the remodel that he can't competently resolve. It could become a liability issue that a general contractor who comes in afterward to fix will have to willingly take responsibility for. Omoto advises that when a homeowner is researching the costs involved with hiring an expert to help with their kitchen remodel, they should only compare experts in "like fields." For an apples-to-apples comparison, he says, "As you're getting prices, you're only getting prices from all licensed general contractors, or all specialty licensed contractors, or all handymen because their prices are going to be different (than the others)." Click on the image below to watch "Kitchen Remodeling Advice for Family & Friends - Selecting the Expert Adviser". 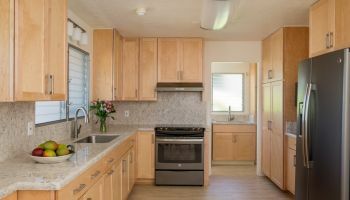 In the video, Omoto offers some very valuable insights in how to manage your kitchen remodeling costs when using experts, emphasizing how you can control the cost by turning a "long cab ride into a short one," especially with respect to when the architect gets involved. This video is chock full of information that only an experienced kitchen designer with years of experience can offer; something that the folks at Homeowners Design Center have in ample supply. To see the first video in the series, "Establishing the Objective," just click on the title. You won't want to miss the third video in the series "The Big Secret!" where Omoto explains how you can control getting the kitchen that you've always dreamed of, on budget, without having to compromise. To learn more information on how Homeowners Design Center can help you with your kitchen remodel, just click on the company name wherever you see it.